Students solve the case with ink chromatography and STEM. 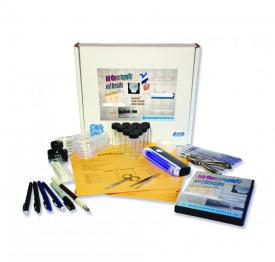 This kit introduces students to ink chromatography and its application in solving forensics cases. They gain experience in creating ink databases, identifying ‘ink tags’ to ‘date’ various inks and then use them, as professional document examiners do, in solving two mysteries involving document inks—an apparent suicide note and a forgery case. Covered concepts include data analysis, chromatographs, inks and their composition-mixtures, compounds, mixtures, molecules, solubility, affinity, polar substances, Rf values, capillary action, light energy, fluorescence, and hypothesis testing. Ordering information: This kit includes materials for three detailed activities (with ‘model’ and ‘inquiry’ investigational paths—a total of four investigational activities), which can accommodate up to 40 students. It also contains a DVD with PDFs of teacher and student guides and other digital content.